Specifically, Strom’s source of NG will be from one of or combination of three natural gas pipeline companies regulated by FERC and currently supplies NG for sale in Florida. These facilities will include the 1) Florida Gas Transmission Company (“FGTC”) and 2) Gulfstream Natural Gas Systems (“GNGS”). Additionally, the Florida Public Service Commission (“FPSC”) recently approved Sabal Trail Transmission (“STT”), which will provide NG through Southwest Alabama, through Georgia and down to central and south Florida. Upon completion of the STT, Strom intends to acquire additional supply from STT. Strom will be purchasing NG from FGTC, GNGS and/or STT under long term purchase agreemerits. Strom also intends to purchase from utilities that have excess NG, and which have obtained appropriate regulatory approval, if required, for the sales of such excess capacity. Strom. Inc. (“Strom”) is developing a project to export liqueﬁed natural gas (“LNG”) from the State of Florida, USA. The LNG will be liqueﬁed at our proposed 70 acres site located in Starke, Florida utilizing modular, scalable, portable LNG systems (“MLNG“) such as those marketed by such companies as General Electric’s (“GE”) “LNG in a Box,” Cryostat, Hamworthy, Chan, Linde, Air-Products, Siemens, Stirling Cryogenics, and/or other similar systems. Some of these MLNG can be mobilized in “less than three months”. Each of these MLNG can produce from “500 to 50,000 gallons of LNG per day”. As demand increases, Strom intends to continuously add MLNG units to increase production of LNG. Strom has begun the process of securing Federal Energy Regulatory Commission’s (“FERC”) authority for use of MLNG for such purpose. On March 24, 2014 Strom filed a motion for declaratory order with the FERC relating to the regulation and permitting of these portable liquefactions systems. On March 27th 2014 FERC established a comment period on our Docket which ends on April 18, 2014. So the very day FERC held its last Scoping Meeting for Transco, Sabal Trail, or FSC, 3-27 March 2014, FERC opened a comment process for an LNG export operation (FERC Docket Number CP14-121) that explicitly intended to use Sabal Trail natural gas. After a request from Strom on 24 March 2014, before the last three Scoping Meetings. And FERC didn’t ever tell us about that even though numerous people asked whether Sabal Trail’s fracked methane would go for LNG export. Oh, and the Strom comment period was for all of two weeks. Strom also intends to comply with Section 3 of the Natural Gas Act requiring pre-fiing and will work with the FERC to ensure we are in compliance with FERC’s rules. Pre-filing, will be completed no later than September, 2014. This application to DOE/FE, however, is Strom’s first application (the “Application”) for authorization to export an amount not to exceed a total of 28.21 Billion Standard Cubic Feet per year of liqueﬁed natural gas (“LNG”) over a twenty-five year period. We further request that our authorization begin either on the date of first export or five years after authorization is granted, whichever occurs first. Such long-term authorization should permit us to export LNG which will be liqueﬁed utilizing MLNG at Strom’s proposed Starke, Florida location (“SFL”) to Free Trade Agreement countries (“FTA”) countries. And remember Strom also filed with FE to export to specific non-FTA countries, and also to all other non-FTA countries. As near as I can tell, Strom has not yet done the pre-filing with FERC it says above that it will do. On 21 July 2014 FERC dinged Strom $24,260 for a filing fee Strom tried to side step, saying Strom had 30 days to pay. Remember, FERC is funded by fees from the companies it regulates, so it’s not likely to let anybody file without paying a back fee first. At least two other LNG export operations have filed as an intervenor or comments with FERC on Strom’s existing FERC docket CP14-121, and other organizations can, too. The owner of the property Strom, Inc. says it has a purchase agreement for is WW ONE Starke, and that Florida LLC does own a couple of pieces of property in Bradford County that add up to about 70 acres, according to the Bradford County Property Appraiser, on 144th Street and a railroad, two miles due south of Starke, FL. Here it is on google maps and the Property Appraiser’s map is below. That’s maybe a mile uphill from Alligator Creek on the north, which flows into the New River, then the Santa Fe River, then the Suwannee River, then the Gulf of Mexico. Our Santa Fe River already knows about this. St. Johns Riverkeeper should also beware. 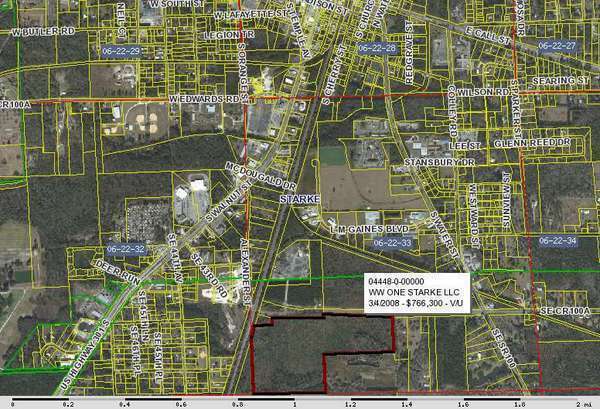 Strom’s Starke, FL location is also right on the divide beyond which water flows to the Atlantic past Jacksonville in the Lower St. Johns River Watershed. Given that one of the already-permitted LNG export companies is Crowley Maritime’s Carib Energy, based in Jacksonville, and Jaxport is gearing up for LNG export, it’s safe to assume trucks or trains with LNG will be passing through the Lower St. Johns River Watershed on their way to Jacksonville.